The Prevention of All Cancers © Copyright 2004 Hulda Regehr Clark, Ph.D., N.D.
First we will build the 1 kHz zapper. We will build it on a breadboard to avoid the tangle of wires, clip leads, and the soldering of other methods. The total cost, as of 2002, was about $29.00 not including the copper pipes. The breadboard is a plastic pad with holes in it. If you look closely at the Radio Shack "Experimenter Socket," you can see the rows are lettered A through J, while the two outermost rows are X and Y. The columns are numbered 1 through 23. Any other breadboard will work, too. If the end of a wire is not bare, use a sharp knife to scrape off about a quarter-inch (1 cm) of the plastic insulation. When stripping wire, if you accidentally cut some of the wire strands off, cut them all off and start fresh. Hopefully you will succeed before you run out of wire! If the wire is solid, great, but if it is stranded then twist it with your fingers to help keep the strands together. When you push a wire (either solid or stranded) into a hole in the breadboard, you should feel it go in securely. If you tug the wire gently it should not come free. If you turn the breadboard upside down and shake it, nothing should fall out. Sometimes (especially with stranded wire which is flexible), the wire will bend instead of going in. Just straighten it out and try again. Hold the wire as close to the end as possible to prevent bending. You don't need to know this, but if you are wondering how the rest of the breadboard works, holes A1 through E1 are connected internally, A2-E2 are connected to themselves, A3-E3, and so forth. Also F1-J1, F2-J2, etc. Finally, X1-X23 and Y1-Y23 as mentioned above. To connect different rows or across the center groove, jumpers are used, of different lengths, called breadboard wires. The resistors and capacitors have no orientation so can go in any way. But the 555 chip does, it has a small circle or dot in one corner. Also, the LED has a flat side on its rim (hard to see but easy to feel) that tells you which way it goes. If you bought the Radio Shack resistor assortment you may be wondering how you tell them apart! The answer is by the color to the bands on the cylinder. There is a chart on the back of the package, but to make it easy, the 1 K Ohm resistor is brown-black-red-gold; the 2.2 K Ohm resistor is red-red-red-gold; the 4.7 K Ohm resistor is yellow-violet-red-gold; the 39 K Ohm resistor is orange-white-orange-gold and the 270 K Ohm resistors are red-violet-yellow-gold. All the resistors in the assortment end with a gold band, so when reading the colors, start at the non-gold end. The 555 timer chip is sensitive to static electricity. A good way to make sure you are not charged with static electricity is to touch a metal cold water pipe or faucet before handling the chip. Although you are working with bare wires and electricity, there is little chance of harming yourself. During assembly the battery is not connected. Even while you are using the zapper, there are no voltages higher than the nine volts of the battery in this circuit. Still, take care not to come in contact with the components while the battery is connected in order not to make a spark or damage a component. Plug in all the components as shown in the pictures. Attach the battery last. Do this very carefully to avoid accidentally contacting its terminals backwards. Cover one battery terminal with tape first. Then snap in the free terminal. Remove tape and snap in the other terminal. If you have a voltmeter and wish to check the output you will find it measures approximately 4.5 V. That is because the zapper is switching between nine volts and zero volts about 1000 times per second. The average of nine and zero is 4.5 V.
Examine the 555 timer chip. Find the dot or "cookie bite" at one end. This starts the numbering system for the lets, called "pins". The pin nearest to the dot is #1. Count them all. Find the 8th row on the breadboard and insert the chip across the "aisle" or groove as shown. Ease the chip in gently. If the pins refuse to go in evenly on both sides you may ease it out again with your fingernail and press the pins a bit closer together. The chip should lie flat against the breadboard when in place. Each pin connects to the row of 5 dots it is in. Identify the row of dots for each pin. Insert the red wire of the battery snap connector. This will bring Positive (+) electricity to the whole row of 23 dots, called X, at the edge of the board. Insert the black wire of the battery snap connector. This connects all the dots on the other edge, called Y, to the Negative (-) side of the battery. This is also called "ground". Do not attach the battery yet. Insert the jumper (red) that will bring the (+) electricity to pin 8. Insert the jumper that connects pin 1 to ground. Jiggle the jumpers till they go in smoothly or try a different one. Also try bending the wires slightly inward for easier fitting. You have now completed Diagram A.
Connect pin 8 to pin 7 through a 1 K Ohm resistor (brown-black-red-gold). Since this is a very short distance the ends of the resistor will seem too long. Bend one end over and down to make a "hairpin". Then cut both ends about 1/2 inch (1 cm) from the end of the resistor; then insert. Connect the row of dots at pin 7 to pin 6 through a 270 K Ohm resistor (red-violet-yellow-gold). Again, bend one end of the resistor in a hairpin; cut the other end off to make them even. Insert. Repeat with a second 270 K Ohm resistor right beside it. This "parallel" configuration reduces the resistance to half, namely, 135 K Ohm. This value is close enough to 144 K Ohm as required on the parts list. This value works as well. Next, you need to connect pin 2 on the 555 chip to pin 6. To do this, choose a jumper (green) that can take you away from the crowded conditions, all the way to row 15 from row 10. Connect pin 6 to another outlying row, such as row 17, through a capacitor, .0047 uF. Push the end at pin 6 in first; then bend the other end slightly inward to insert easily. Insert the other capacitor also .0047 uF, between pin 5 and the same row. After solid insertion straighten out the wires and make sure no wires are toughing other wires inappropriately. If any insertion is especially difficult, use long nose pliers to grasp a wire near its end for firmer pushing. Connect the outlying ends of the capacitors (row 17) to ground using a jumper that crosses the aisle (white). Pin 4 also gets energized by the battery. Connect pin 4 to an outlying row (row3) with a jumper (gray). Connect the same row to the (+) side of the battery with a jumper. You have now completed Diagram C.
Now to connect the LED. Connect pin 3 to an unused row, such as 14, through a 2.2 K Ohm resistor (red-red-red-gold). Find the flat side of the red dome on the LED. The flat side has the shorter wire. Insert the longer wire of the LED at row 14, the shorter wire at ground. The flat side is grounded. You have now completed Diagram D.
Pin 3 is the output. We will connect this to one copper pipe that contacts the body, but we will do this through an output resistor. Connect pin 3 to an outlying row, such as 2, through a resistor of 1000 Ohm (brown-black-red-gold). This resistor protects the circuit if you accidentally short the two copper pipes as you hold them. Connect an extra long jumper at row 2; it must reach to the outside of the box that will hold your zapper. Choose a light color that symbolizes the hot (+) wire. You have now completed Diagram E.
Pin 1 is already grounded. Connect another extra long jumper to the ground row, using a dark color (green) that symbolizes ground. This will connect to the other copper pipe that contacts the body. Now to add the offset resistor. connect the 39 K Ohm resistor between the battery and the output at row 2. This completes Diagram F.
To include a switch, pull out the red wire of the battery snap connector from its seat in the breadboard. Cut the red wire in half. Strip 1/2 inch of insulation from each newly cut end. Practice using the wire stripper on a different piece of wire first. Twist the bare ends into a tight form. Insert one end in the hole of one switch terminal. Make a tight connection. Connect the other bare end to the other switch terminal. If possible, ask an electronics shop to solder these 2 connections for greater durability. Reinsert the red wire in the breadboard. Connect the battery, but do this VERY CAREFULLY. Remember to cover one battery terminal with tape until the other terminal is safely seated in its holder. Then remove tape and seat the other terminal. You could destroy the chip if you touched the wrong terminals briefly. The LED may now light. If it does not, throw the switch. For protection you may place your zapper inside a plastic container with lid. Mount the switch and battery on the outside for convenience. If the LED still doesn't light, it may be in backwards. Disconnect the battery, tape over one terminal, turn the LED around, and reconnect the battery. Being in backwards does not harm the LED. If it still does not light, or flickers, suspect the switch connections. Remove the switch or solder it. If the battery gets hot, disconnect it immediately! Check that there are no bare wires touching each other. Double-check that your wiring matches the picture. You may have drained the battery a lot, so replace it with a new one. If everything looks perfect, but the LED still doesn't light, you may have a defective component. That's why the Parts List advises getting a spare 555 timer chip. The 555 is the most likely component to fail. Disconnect the battery and try swapping chips (pay attention to which corner has the circle). None of the rest of the components are likely to fail, but you can try swapping them if you like. Make sure your battery is fresh. Use a battery tester. An oscilloscope shows you a high-speed picture of how the voltage changes. You can actually "see" the zapper go from zero to nine volts and back repeatedly. And you can calculate the frequency to make sure it is about 1000 hertz (low frequency) or 30,000 hertz (regular zapper). Oscilloscopes are expensive, so rather than buy one, it is better to ask you local television or VCR repair shop if they would use their oscilloscope to check you zapper quickly. Here is how the zapper output typically looks. When your zapper is turned on, the bottom flat lines of each pulse should be 1/4 volt above (more Positive) the zero line. To see the offset more clearly, change to .5 volts per division, see page 514. Zapper with a 1 kHz output, like you just made. Plastic carton, such as a cottage cheese or food container. 4 ohm or 8 ohm loudspeaker, 2" or 2 1/2" (5-7 cm) diameter, with a North Pole face. Many loudspeakers on the market are South Pole. Be careful. Take your compass with you as you shop; the compass' North should be attracted to the face (see picture). A field strength of 10 to 20 gauss is preferred. This means the magnet on the speaker should be able to lift a loose chain of six paper clips. The current and watt ratings given for the speaker are not important. Some loudspeakers have "collars", or domes, or are encased, or shielded. Do not choose them. They do not work. The magnetic field is not necessarily stable either. Dropping the speaker or overheating it could change the polarity. Check yours before use with a compass once a week. Assemble the zappicator food box parts. Find the (+) and (-) sign on the loudspeaker. You will be attaching a lead (wire) to the plus side. Cut a hole, about 1/2 inch square in the side of the plastic carton for the lead to pass through. Attach the loudspeaker to the bottom of the carton, inside, taping it down securely, or using hot glue around the edge of the cone. Push the alligator clip lead though the hole and attach it securely to the (+) connection on the speaker. Attach nothing to the Negative terminal. Find the (+) terminal of your 1 kHz zapper. You must be sure of this. If you did not build it and if it is not marked, take it to an electronic shop; the clerk can check this for you in a minute. Label it. Connect the free end of the clip lead to the (+) terminal of the zapper. If you need to use two leads to connect your speaker (+) terminal to your zapper (+) terminal, do so. Attach nothing to the Negative terminal. Turn carton over to give you a flat surface for food placement. Place food, packaged food, beverage glass, or filled plate on the top of the carton. It may hang over the edge. Turn zapper on for specified time. Metal objects, like cans, placed on the zappicator will become magnetized by zappicating, showing a South Pole at the base and North Pole at the top. Numerous poles are induced, not necessarily stable. The food inside the can shows the same polarity as the part of the can that is touching it (not opposite). For better quality food, it would be ideal to empty the can first and zappicate in a non-metal container. Glass jars should have their metal lids removed before zappicating. This gives all the food a north polarization like the polarity of the speaker. Otherwise the metal lid becomes polarized so that half the entire can becomes north and the other half south. Foods and beverages become north polarized, although they may have started out south or without any polarity. This is because water is diamagnetic and takes on the same polarity as the field nearest to it instead of the opposite polarity as iron-like metals do. The Hulda Clark Zappicator may be used to zap anyone or anything that cannot hold copper handles. That includes pets! 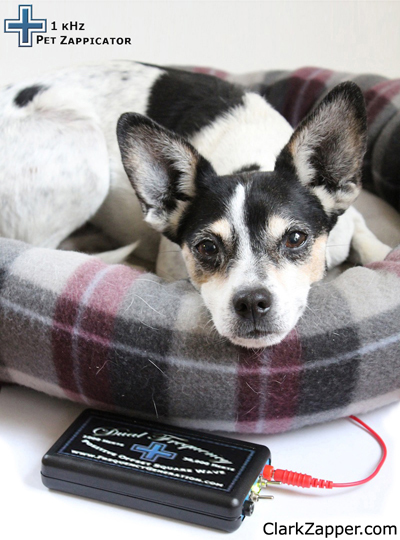 Just set the North Pole Speaker Box under the pet bed, remove all metal collars, and zap while pets relax on their bed.